Click on the picture to see a larger image, then use the back button on your browser to return. Celebrating the fields of Provence! This exquisite handpainted wooden tray celebrates the lavender fields of Provence. It is made in the U.S. by an artist who loves Provence as we do. 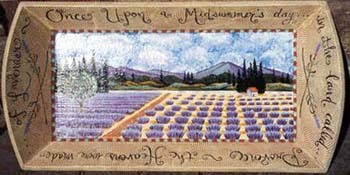 She has inscribed it on its sides "The heavens were made of Lavender... once upon a midsummer's day in Provence."